Your audience is less interested in the knowledge you can impart to them, and more interested in how you can improve their lives. So I decided that I needed a better term for what it is we bring to the table as online teachers. Then I sat down to watch an episode of MasterChef and saw what the chefs were bringing to the judges' table. Sauce. Not the collection of sugary ketchup and Worcester sauce that gets brought to the table with your toasted sarmie. No way. We're talking sauce that's been made by drawing out all the goodness of marrow bones, adding just the right herbs and spices, balancing it with a bit of acidity, and then reducing it until it turns into a rich elixir that was so good, one of the judges wanted to drink a whole bottle of it! You have got a unique set of skills, past experiences, and favourite tools. You've got a unique approach to life and work and a unique personality. And you've got a unique network of friends and business associates, and these people have influenced you in a unique way. All of these are the ingredients of your online teaching awesome-sauce. Want to stand out from all the other online courses out there? Then you need to offer the wow-factor that only you have - YOU! Now, unfortunately, uniqueness on its own doesn't sell! But if you can identify how your uniqueness can offer great value to your audience... Well, now we're talking business! Or should I say, now we're cooking! It can be difficult just listing all the things that you are good at. And because you’re assessing yourself, it’s easy to miss some aspects of your experience, skills or personality that could be the ingredients of your online teaching awesome-sauce. I would never want that to happen, so here are some questions to get you thinking about YOU. I've also made you some nice worksheets to print out and fill all this in - just let me know if you'd like a set in the form at the end of this post. In most questions, I ask for 10 things, but go on, be a star student and give me 20… Or 30, you overachiever, you! What have people asked you for help with (in the last 6 months or so)? Try and list 10 questions that people have asked you. Write down 10 new tools or techniques you’ve learnt in the last year or so. Write down 10 facts, concepts or tips you’ve learnt from a book or on a blog. Write down 10 words that describe your approach to life. Write down 10 of the things that make you YOU. Think personality traits, quirks, habits (good and bad), and the like. Now go back to your audience’s pain points that you identified in Step 1. How could you (with all your knowledge, skills, experiences, and personality traits you’ve just identified) help them to ease those pains, or take them away entirely? Based on your answers to these questions, make a list of 10 topics that you could teach your audience. Make sure your topics are specific and clearly solve a problem your audience is facing. Although you don't need to settle on a course title at this point, I'd like to give you some examples of how I've refined the titles of two courses to clearly call out the intended audience and to highlight the problem and/or the intended solution/outcome very clearly. Social Development of Children (too vague, no audience, problem/solution not clear). Managing Your Small Business's Finances (too vague, broad audience, problem/solution not clear). So although you don't have to finalise your course title, make sure that your topic is specific enough to be solving a real problem that your audience is facing. So, you'll now have 10 possible topics to choose from. Now you have to select the very best of the bunch to run with (for now - see my little note a bit further down). How easy will this topic be for me to implement/develop? What kind of impact will this topic have on my audience? Each topic will have a score out of 10. Choose the topic with the highest score. If there is a tie, or if you feel heartbroken about discarding one of your options, then remember that you are only choosing a topic for your first course. Remember: you’re in the process of building a teaching business, so there’ll be plenty of opportunities to build your second, third, and tenth options! It might also not be the worst idea to leave your very favourite course until later – that way you can develop your teaching and marketing skills so that you can knock it out of the park when you release your signature course in the near future. So, you’ve got a course topic. How very exciting! Now you can start thinking about that course outline, but try to think broadly at this stage – don’t get bogged down in too much detail. What is the course mission or overall goal of the course? What knowledge will your students have? What will they know? What new skills will they have? What will they be able to do? How will their attitudes/mindsets be different? Once you have answers to these questions, put together a draft course outline with modules and lessons. Outlining and planning courses is an extensive topic. Would you like to know more about my outlining and planning methods? If so, please leave a comment and I will happily put together a nice big post for you! So, what's your course topic? I'd love to know if this process helped you to settle on a course topic. Did you start with no idea, or far too many ideas? What topic are you going to run with, and why? Please let me know in the comments! Don't forget to get your worksheets to help you thorugh this process. And if you've enjoyed this post, please would you take a few seconds to share it? 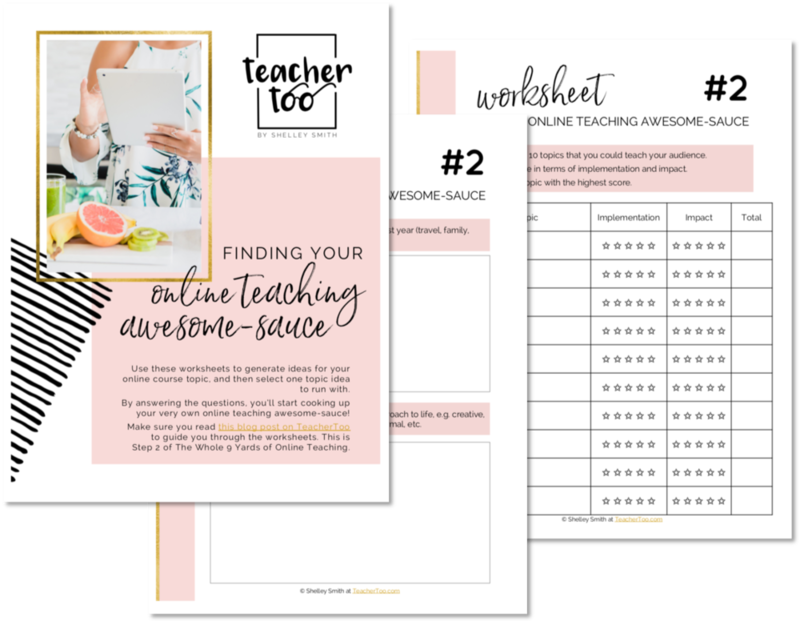 Get a set of worksheets to guide you through the process of finding your online teaching awesome-sauce! They're like your recipe cards for online course deliciousness!